These tailor-made worksheets precisely deal with expressing the Pythagorean theorem in terms of trigonometric functions. Topics involving Pythagorean identities to simplify trig expressions, finding the values of trigonometric functions and mastering the trickiest part - verifying or proving the statements are included here. 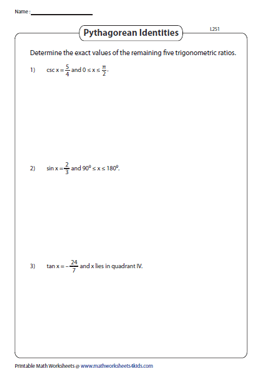 Attempt the free worksheets for a starter and subscribe for more. 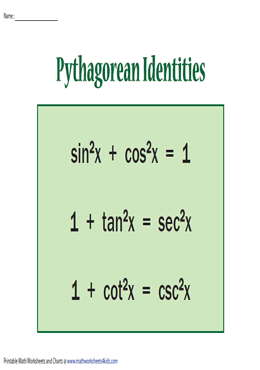 Introduce Pythagorean Identities in Trigonometry with the chart provided here. Equip yourself with a thorough knowledge of the identities, as a precursor to the tasks featured here. 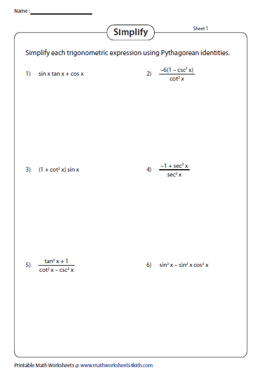 The worksheet focuses on simplification of trigonometric expressions using the Pythagorean identities in combination with the other trigonometric identities. 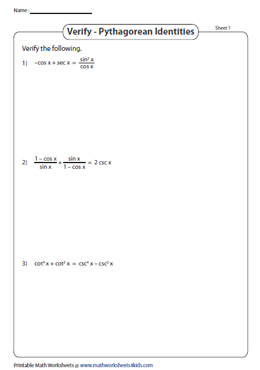 Attempt this array of worksheets encompassing exercises to find the value of trigonometric functions based on the given trig ratios and the quadrant. Apply Pythagorean Identities to solve each problem. 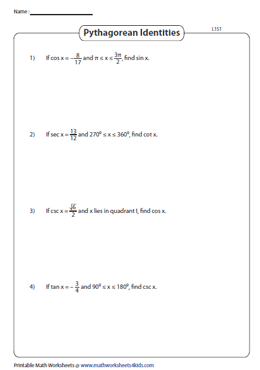 Reinforce the usage of the identities with these worksheets, employ them to find the exact values of the other five trigonometric functions; based on the one given. Exercise your brains with this worksheet to verify the given trigonometric expressions are equivalent using the Pythagorean identities.